vCloud Director 8: New Features And A New UI Addition... - VIRTUALIZATION IS LIFE! Since June the vCloud Director SP Beta has been running with a lot of renewed interest in the IaaS Platform. The beta was well participated in and there was a lot of robust discussion around the future of vCD as well as questions around the lack of a decent UI for those without in house development skills to exploit the new API only features. The beta program was closed the weekend of VMworld San Francisco with v8.0 GA’ing a few weeks later. With the v8.0 SP release the vCD team have started to incorporate enhancements from the vCloud Air vCD builds, though the original 6 month lag between VCA services coming to the SP builds seems to have fallen by the wayside. Before diving into the new features of the 8.0 version I thought it would be a great time to highlight the release history of vCloud Director since v 1.0 was released back in August of 2010. There have been 6 major releases and 16 minor releases which backs up one of my biggest claims around platform maturity and as to why vCloud Director is the best Cloud Management Platform on the market when it comes to the abstraction of vSphere resources and presenting pools of compute, storage and networking via a true multi-tenant interface. This to me is the biggest reason to look at upgraded to the new build. Support for vSphere 6.0 is significant for Service Providers who are looking to upgrade to take advantage of all the new features and benefits and optimizations. Note that Hardware Version 11 is not supported and won’t be exposed via the Provider vDCs. 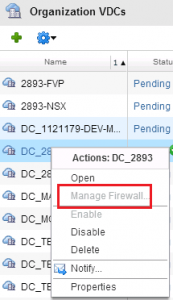 This is also a significant feature that allows Service Providers to have NSX-v 6.1.4 deployed and working in a supported fashion with vCloud Director. Deployment of the vShield Edges will be 5.5.4 builds and allow deployments, redeployments and manageability to be maintained. System administrators can now develop organization specific virtual data center templates with pre-set resource and delegation rules. Organizations deploy these templates to quickly create new virtual data centers on a self-service basis – Without API capabilities this feature can’t be accessed…however I don’t see a great amount of value in this particular feature as in general SPs doing their own provisioning do so off workflows that take into consideration self service vDC profiles. System administrators can now reconfigure virtual machines within a vApp, as well as network connectivity and virtual machine capability during vApp instantiation – Again from what I’ve seen this features can’t be accessed unless you are deploying and modifying vApps/VMs from the API. I know that this perticular feature solves a problem with Zettagrid faced in creating our vCD UI where VMs needed to be created first and then only able to be modified after that was complete…this allow VM composition on the fly. OAuth2 tokens are now supported – Probably a feature that isn’t going to be used by most Service Providers…unless I’m missing something? Prevents a few tenants from consuming a majority of the resources for a single instance of vCloud Director and ensures fairness of execution and scheduling among tenants – This sounds like an awesome features that gives the ability for workloads to be throttled to protect against noisy neighbors and sets more granular control of what a tenant can consume in terms of storage, compute and networking…however it’s only offering a new algorithm that ensures operations running or in queue from a “busy” tenant do not stop or slow down a request from a “sedentary” tenant. The tenant throttling feature only gives control over the number of simultaneous resource-intensive operations any tenant can run…ie this might be fairly useful in large (vCloud Air) vCD deployments, but isn’t a ground breaking feature that offers too much to the majority of SPs. The answer to the question as to what’s Changed in the UI is…nothing…however interestingly I did spot a UI addition which had been introduced (apparently undocumented) in preparation for the still not yet in Beta Advanced Networking Service which will allow vCD to interact with a new appliance that acts as the gateway for vCD and NSX to talk advanced services. 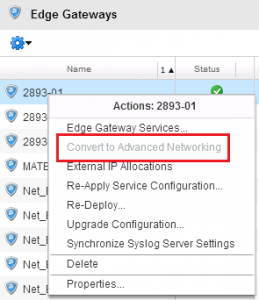 Can’t say too much more on the Advanced Networking Service but it will be fed down to vCAN Service Providers on the back of it’s release in vCloud Air last month as part of VMware’s commitment to delayed feature parity for SPs deployments and vCloud Air…good to see some UI enhancement in any case! As I mentioned above for the majority as Service Providers that can’t make use of the new features the biggest feature enhancements in this release is the compatibility with vSphere 6.0 and NSX-v 6.1.4 and even for those that have the capability to develop against the API’s the vApp Enhancements around VM recomposition will allow for a more streamlined provisioning flow for VMs but the other features are a little less impressive…however I am certainly looking forward to the next release as it should deliver a lot more vCloud Air service features.